Easy-to-use utility for dumping data from instruments equipped with RS-232 output is available for download. At this moment, the utility is provided for free. Unpack all files to a dedicated folder at the destination computer. 1. Connect instrument to the appropriate COM port. 3. Select proper port and adjust communication parameters. 4. Click “Browse” button to select destination file. 5. Click “Start dump” button. 6. 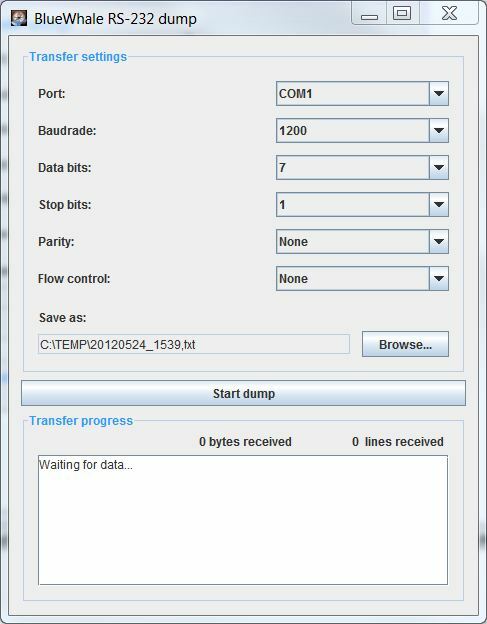 Start dump in the connected instrument. 7. Program shows transfer progress. Wait until all data are transferred. 8. Click “Stop” button to stop transfer and close destination file. 9. Repeat steps 4-8 when needed. Software clears the destination file when “Start dump” is pressed.